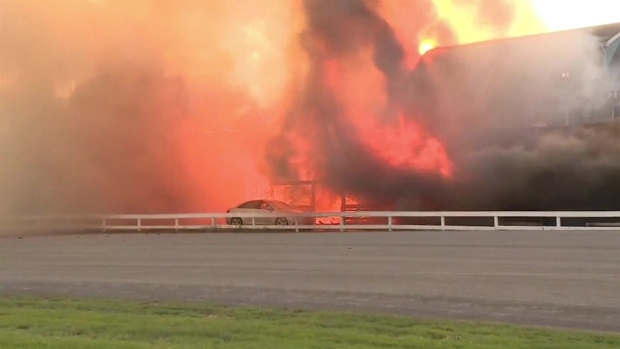 A fire has devoured a barn on the grounds of a historic New York race track. The two-story barn housing horses at Goshen Historic Track went up in flames Wednesday, and the fire threatened to burn the other barns next to it. People rushed into the neighboring barns to save the spooked horses inside. One man was driving by with friends when he saw the fire and went to help retrieve the horses from the barns. "The horses were absolutely freaking out," said Charles Perlao of Rockland. "They were running around, really kind of in a panic." 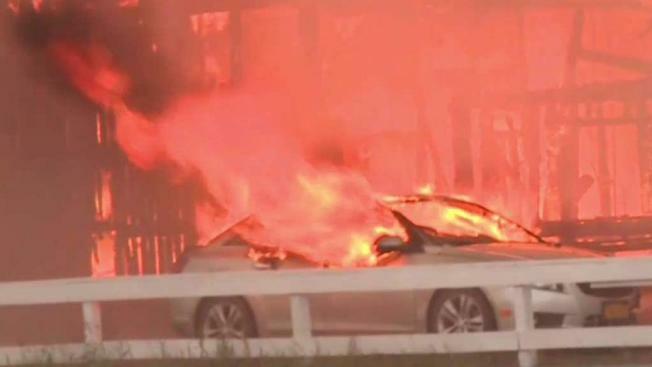 A fire devoured a barn on the grounds of a historic New York race track. "All the horses are out. Everybody did a good job," he said. About 16 horses in the barns were rescued. The Goshen Fire Department says preliminary investigation indicates the fire started in one of the barns that houses a blacksmith shop, right behind the Harness Racing Museum and Hall of Fame, which was not destroyed. A cause wasn't immediately clear. The Goshen Historic Track is the world's oldest active harness racing track, according to its website. It's been a registered historic landmark with the National Park Service since 1966.